Carnival in Rio has been called the world's most famous party. A million tourists join millions of Rio de Janeiro citizens ("cariocas") in enthusiastic revelry spanning several days. The Sambodromo parade (described below) is number one. Close runners-up are the street processions and masquerade balls. 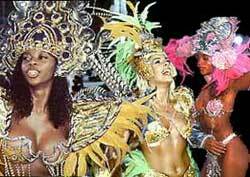 Carnival in Rio takes place during the days preceding Ash Wednesday, the first of 40 meatless fasting days preceding Easter (Carnival derives from "carne vale" meaning "farewell to meat"). Although the official Carnival in Rio starting day is Saturday, the partying begins in earnest the night before and continues through Tuesday (Mardi Gras means " Fat Tuesday"). The Sambodromo is a 700-meter (half-mile) long parade strip flanked by spectator stands and luxury boxes. The sounds and sights of the parading samba schools that go on from dusk to day break. On the Sunday and Monday nights before Lent, the seats are filled with over 60,000 eager on-lookers. Tickets cost up to hundreds of dollars each and sell out quickly.